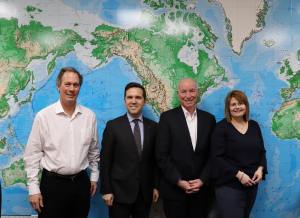 U.S. Representative Joe Courtney, from Connecticut’s 2nd district, visited Roto Frank of America’s manufacturing plant on March 21, 2019 to meet with Chris Dimou, Todd Byron, and Beatrice Horvat to discuss tariffs and workforce development. Dimou explained the impact that tariffs have on manufacturers, including Roto Frank of America, Inc. The Congressman gave an overview of where tariffs currently stand and promised to work on initiatives towards and mitigate any further impacts that tariffs hold. Furthermore, Dimou informed Congressman Courtney about the Workforce Development initiatives Roto Frank of America, Inc. has been undertaking throughout the last few years in order to support closing the gap of skilled labor. Congressman Joe Courtney was very encouraged to hear the great strides that are being made by Roto Frank of America, Inc. in collaboration with the German American Chamber of Commerce New York and the Middlesex Chamber of Commerce concerning development of the workforce pipeline. Also, Congressman Courtney informed the group that he is a senior member on the House Education and Workforce Committee and provided an update to their progress in this area. About Roto Frank of America, Inc.
Roto Frank of America, Inc. is wholly owned subsidiary of Roto Frank AG, a global leader in window and door hardware, with 18 production plants and more than 40 subsidiaries worldwide. Roto Frank of America, Inc. is a Chester, Connecticut-based manufacturer of window and door hardware which offers solutions for North American and European applications.